Maybe love is in New York City, already asleep. You are in California, Australia, wide awake. Maybe love is always in the wrong time zone. Maybe love just isn’t the marrying type. Maybe the next time you see love is twenty years after the divorce–love looks older now, but just as beautiful as you remember. 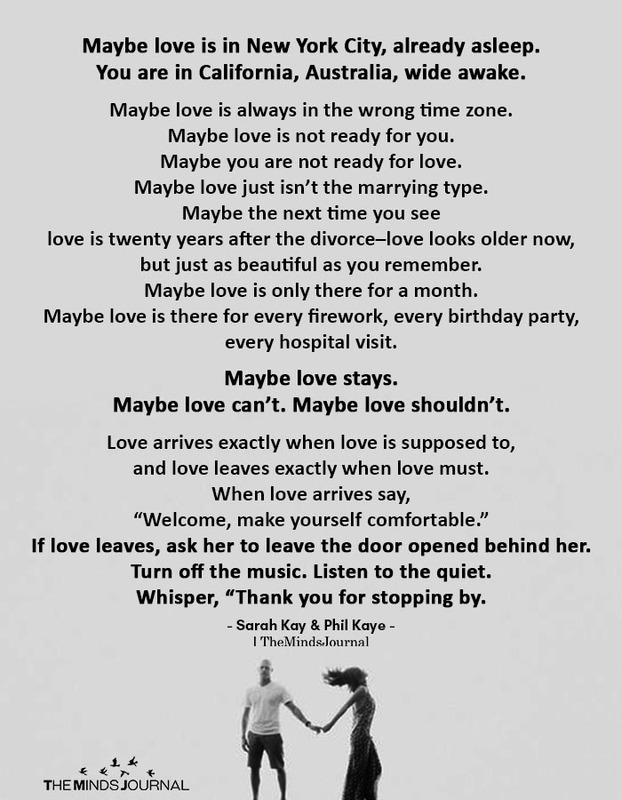 Maybe love is only there for a month. Maybe love is there for every firework, every birthday party, every hospital visit. Love arrives exactly when love is supposed to, and love leaves exactly when love must. When love arrives say, “Welcome, make yourself comfortable.” If love leaves, ask her to leave the door opened behind her. Turn off the music. Listen to the quiet. Whisper, “Thank you for stopping by.